Hikari Oshiro leads the worship team at CCNaha. She does an excellent job and we at the Worship Conference were so blessed with great worship. It is always a blessing to be “ushered” into the presence of the Lord. 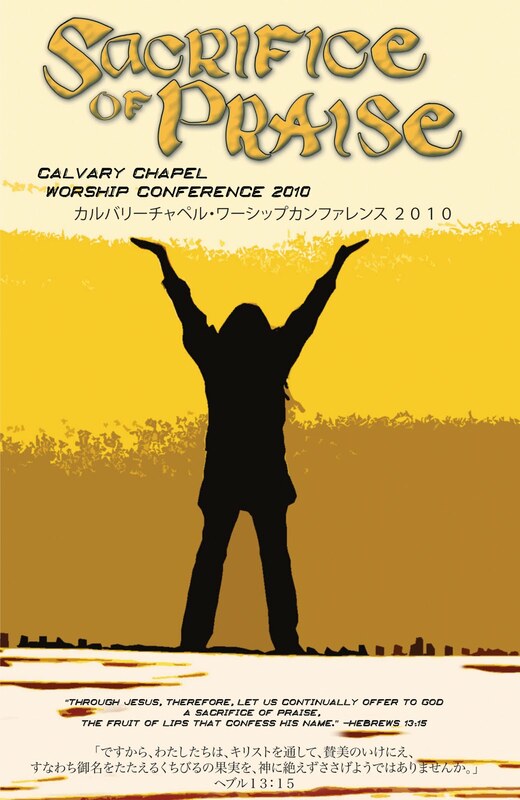 The Calvary Worship Conference here in Okinawa began Wednesday night the 28th of April. 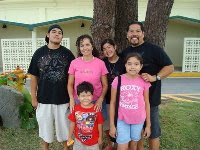 The first session was held at CCOkinawa and Pastor Travis Takamiya was the first speaker. It was a wonderful night and a great place to “kick off” the conference. We were all so blessed. Sometimes when you are driving in Okinawa you try new routes to see if you can get different places faster. Well, in Naha I took a different route and at a stop lights I saw this interesting picture. If you notice it is a pet store above this restaurant below. The picture on the restaurant is a big steak! I know that they do not serve pets, but it sure looks like it. I don’t think that I would ever eat at this place. We would ask you to begin praying for us as we are starting the process of “Nationalization” here in Japan. We spoke with the head office in Naha City and they want to have a meeting with our whole family. Because we are Permanent residents here in Japan and have met all of their requirements, we have the opportunity to become Japanese citizens. There are some things we need to pray about, there are pro’s and con’s with being a Japanese/American citizen. Our IBS class has been held for the first time in Japanese and English. Tokito has been translating as well as teaching along side Pastor Tom in this Bible Class. The Japanese and English students have been doing excellent! It is a blessing to see the students who are growing in their teaching abilities. Pastor Tim sent me these pictures of them getting their water out of the spring up in Nago. The water is so pure up here that everyone just comes and fills up their containers. The water looks delicious. Just one more benefit of living in Paradise. After w2 on Sunday night we celebrated Joanna’s birthday with a tasty cake the Rob baked. It was a fun celebrating after a good service. Everyone had a blessed time. Saturday evening we took Joanna out on her Birthday to Marco Polo’s restaurant. They serve some good dishes as well as “all you can eat” bread. Joanna likes this restaurant so we took her there, it was an exciting and interesting evening. Again, people say it was a “waste” to draft him so early, but clearly others were interested in him too. Pray for our brother Tebow that God will use him in an incredible way. Birthday Breakfast with my Bride! This is the view from right out of our room. The motel was really small in Nago closer to the Motobu area. All night you can hear the water right outside your window. They had an excellent breakfast for us in the morning. A good breakfast with the Birthday girl. Happy Birthday Joanna. Joanna’s Birthday is this Saturday so we decided to get away Friday afternoon and spend some time together. Joanna did not know what I had planned, but we went out to lunch and never came back! We took some time to get away in Nago City. We celebrated the birthday of Temote the director of Teen Challenge Okinawa. It was a blessing after Wednesday night service to spend some time with our brother. Teen Challenge has been such a blessing to us here at CCGinowan. The guys are number one! God bless you Temote and Happy Birthday! 2010 Worship Conference - "Sacrifice of Praise"
Hello everyone! We are getting ready for the Calvary Chapel Worship Conference that will be held next week at Calvary Okinawa, Calvary Ginowan and Calvary Naha. We are looking forward to a blessed time. All of the Calvary Pastor's in Okinawa will be teaching (Pastor, Rick, Tom, Masaru, Tim) and we are also having Pastor Travis and Santo from Tokyo coming down. Please keep this conference in your prayers, we are looking forward to a blessed time. $120 Dollar Bowl of Ramen! We love ramen in Japan, but this is just ridiculous! A $120.00 dollar bowl of ramen. For some of you who have eaten at the world famous "Dragon Restaurant" in Okinawa, you know that a huge bowl of ramen (that you can almost swim in) cost about $4.00. The best ramen that I have ever ate was at the "College Ramen Joint" which cost about $9.00 dollars and it is delicious! But $120 dollars, no way! Please check out the video. I was at the doctor’s office today and when I was in the office this program came on, I could not believe it, Sosimo was on the tv. I just had to take a picture to prove it. I do not know what the program was about, but there he was as clear as day. I thought he was supposed to be finishing his 4th semester in Murrieta? Well, there you go, he must be somewhere in Mainland Japan. The Inka boyz came and blessed the Bible College Students with a rockin meal on Saturday night. They slaved over the kitchen cookin up a fabulous Authentic Peruvian Dinner. The soup was “out of this world”, Anna Hebel does not usually like soup but she went back for seconds. Everyone ate way beyond their means, it was sooooo good! You just could not get one plate. Thank you Kevin and Nick, we were all so blessed! Here is some of Rob’s family in the desert. He had a great time hanging out, but he will be returning shortly back to Okinawa. Please pray for Rob’s safe return. He has to get back to the baseball field, and I am sure that he has missed it. Photo by Joel Happy Birthday bro, we are blessed for you on your Birthday. Sunday night the crew celebrated while some of us were on our missions trip to Korea. One question, is this guy 3 years old or does the candles represent the Trinity. Probably the Trinity, because he looks older than that. God bless you Chuck, we hope you had a great celebration. Sachikosan taught Friday morning at “Lectures in Ministry”. As some of you well know, she takes missions trips to Nepal and recently came back from one of her trips. She showed us a powerpoint presentation and allowed us to ask her some questions, it was good morning. Thank you so much Sachikosan. What is going on? It’s still raining! This year has been so interesting; usually it is getting warmer, full on beach gear, but it is cold and rainy. Last night we had a huge thunderstorm, we all experienced the power of God with all the Thunder and Lightning. This year has to be something on record. It starts getting warm and then we get a big cold front. We should not really complain, it is going to get hot, and then we are going to wish it was cold again. Stephen Neiwind is heading home for Central California today. It was good having him here, the Lord taught us all a lot of good things. He heads back home, back to doing more music ministry. God is good and as long as Stephen listens to the Lord He will use him in a great way. God bless you bro, God is doing a good work in your life. We made it back to Incheon City (next to the airport). The last night we slept there because we had to fly out early Wednesday morning. The group took the subway and train system all the way to Seoul where we met up and took the train into Incheon Airport. We had a blast just hanging out one more night. God bless you Korean Krew, we had the greatest time with you in K-Town. We were at Independence Hall in Cheonan City Korea, when these elementary students came up to us in the Cafeteria, they mobbed the students, especially Justin. They were taking pictures of him, wanting to shake his hand. Finally the cafeteria lady chased all the students away outside and they were screaming because they were excited to meet Justin. When the students went outside, they followed Justin all around the museum buildings. It was a mad house, we still don’t know who they thought that he was. Our last meal in Daejeon was our best, “Dak Galbi” (Chicken in spicy red sauce). In the bottom picture are brother and sister Peace and Grace right next to Jillian. The dinner was excellent, so good, a blessed time. On the streets of Daejeon Justin spotted a few pro players. He looked at them and said “Hey, they are Pros”. He was totally right, we saw a picture of these gals earlier in the day and Justin saw them play on TV the other day. The girls actually bought everyone a Waffle cone Ice Cream. It is not every day that you meet Pro Volleyball Players, and it is not every day that they buy you a Waffle Cone. Next to the church in Daejeon there is a hairstylist who is always busy, so Tamiko decided to “give her a try”. Her new style came out great, but you will have to wait until Wednesday Okinawans to see the new cut. The price was just right, only 7,000 Korean Won, about 550 yen ($6.75 American Dollars). Good looking hairstyle Tamiko, lookin good! This is one of the cute kids at the orphanage in Daejeon that everyone loves. We actually do not know his name, we call him “Sammy” after Sosimo’ brother in the states. They kind of look the same, both of them are really cute. Sammy has a lot of energy. He comes over to you, gives you a candy and will “chow down” on your food if you don’t watch out. I have seen him now for the last year and a half and he is getting older. A cute kid, God has good things in store for him, please pray for brother “Sammy”. It was a blessing to spend the late morning, early afternoon at the “house of hope”. We spent a lot of time with the residents there and then went out to work on the field. The girls were in charge of laundry and the guys dug for rocks. It really was a great time of ministry.